Dex - fast becoming an organic cotton fabric expert. He began helping us three years ago. Working with us has turned him completely feral. Dex is brilliant. Need the PC or website fixing, need a cheery smile or a polite answer to a difficult question? He's the go to guy and many of you will have received his fast and friendly responses. We always have bundles of remnants, and now we have a new clearance section on the website. We have rolls of fabric sometimes old stock, sometimes seconds, sometimes oddities or sample rolls.I have just put some rolls of bamboo fabric, that is bamboo viscose fabric. We sell these off at wholesale prices by the roll. We will be adding a lot more over the next few weeks. You may find fleece fabric there or organic cotton printed designs, sometimes plain organic canvas and organic denim. gsm means grammes per square metre so typically a voile or muslin would weigh less than 100 grammes per metre. Shirtweight would be 100 to 200 gsm. Lightweight canvas would be around 300gsm. Denim is often classified in oz per sq yard. 12 oz = 400 gsm. Organic cotton fleece fabric - sweatshirt fabric that we stock is usually about 330gsm, loop back jersey/fleece is 260gsm. Oct 30 2017 Delivery recieved with twill, cambridge canvas, cotton voile, batiste and cotton muslin, all organic fabrics of course. The light weight fabrics they put on small rolls. The heavy fabrics on huge rolls... there is always something! Don't know who the guy with the bald head is? Oct 2017 we have just recieved samples of QUILTED fabrics and they are fab!! Stocks arriving Jan 2018. When I was about ten I found a penny (a big old one) on the way to school. The thrill of picking it up and brushing the dust was delicious. We get lots of lots of website wanderers who really seem to love stumbling upon the website. We don't advertise at all, so I guess that maybe customers feel like I did when I picked up that penny and it's just lovely to get those thrilled and personal messages, thank you. Two years ago I began a new project . www.borderprint.biz. The fabric has arrived. The website is finished. Now comes the moment of truth. Will anyone like it? The organic cotton fabric is based on our crossweave weight but extra wide - 140 cm with a border down both edges. So many possibilities! Over to you.. tennis racquets, flowers, barbed wire, Michael Buble, Elvis, burgers? An enormous delivery from my partner Genesh in Kerala. Most fabrics back in stock. 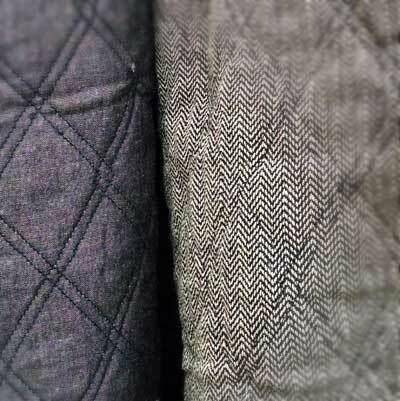 Lovely duck egg blue crossweave has been restocked. Muslin squares back in stock. For printing - blank aprons, napkins, bags, cushions etc are back in stock. Tea towels sold out sorry though we do have the bamboo and organic cotton ones. Some amazing new prints too..... we will be preparing samples of those in the coming month. Arriving in three weeks, new fleeces, striped!! Plus plush (furry) and some new types of fleece and jersey. We will be watching every frame! !- Disney used loads of our fabrics for this film. Have a look in their windows this month. They kindly used lots of our linens and natural organics for sculptures and displays in many of their shop windows. Do you want to waste 55 seconds? Organic Textile Company at work. We weave our ideas and thoughts, our skills our hopes. Imagination the weft, patience the warp. The chemise, the shirt, the cloth the cushion, the life. We weave ourselves in all these things. There will be problems – please let me know. Any ideas welcome. New Fabrics. We have three new lovely crossweaves. Rich blue soft, Rich blue red and brown.If you would like free samples please go to the website at the bottom of this webpage and order them. crossweaves. Postage is a nominal for these samples.This is my arty picture!! Dex. This is Dex - he did the new Logo and he is five ten times faster than me on the PC. Aprons We have most blanks (items to print on) back in stock. Genesh my partner in Kerala emailed me today. I studied in a regular college 27 years back. As son of a weaver there is no colorful memories.I remember I was going to with bare foots to study Economics. Father was not able to give money for books, and I was living at Sister's home and they give money for books when they could. Yesterday I told the story to my kids and they sit hardly to hear!.........they have 2-3 foot wears now! One to school, another playing another for outing! Weekend I regularly went to home and for money used to weave in a hand loom to get Rupees10- 25 from brothers. ps we told him tattooing his face was going beyond normal company loyalty. I didn't write because there was nothing to say - now there is. Genesh; he makes our fabric in Kerala . He has to purchase the organic yarn. He takes it to the dyer. We use many different yarn colours. When he collects the dyed yarn he sometimes drys it at home. He then distributes the yarn to the various weavers around town. He has to instruct them about the design of the fabric - how many warp threads, how the loom should be set to achieve the right weave. When the weaving is done he has to wash and dry the fabric, maybe he has to print it. Then he inspects it and rolls it onto 25 metre rolls. Then he has to invoice and load 4 tonnes of many different fabrics. How detached we become from the cloth we use, the tea we brew . Forgetting all the time the resource and energy that makes our world full of joyous things like cloth and tea. It feels a bit mean to email and say 'come on Genesh the shipment should have left on 6th Sept. It is about to leave India and has restocks of many of the fabrics you have been asking about, black and blue denim, canvas, flannel and crossweaves, plus teatowels, scarves, muslin squares and bags. New prints too. Ive been in several bands.... choosing the name is great fun but you can make dreadful mistakes after a long rehearsal and a glass of wine...... Perhaps that was why 'Wok' never made it big time, or little time, or... any time at all really. Imagine if Bob Dylan had decided to name himself Bob Thomas (He named himself after Dylan Thomas)... surely no one would award a Nobel prize to 'Bob Thomas' - its just not a cool name. Our next print collection arrives in about a month - I was going to call it 'Grunge' but you all said 'Woah Phil !!' So..after weeks of thought.... how about 'Threadrocks'.... cool and groovy .... or pretentious?? photos will be in the next newsletter. plus - Dotty. Very simple small dot. Because it is lightly printed on our crossweave fabric it means that it is reversible, so cuffs or pocket or trims, edges and reverse can be plain or patterned simply by turning the fabric. Several different colourways - SAMPLES. Lots of great feedback on these print fabrics. The new marl fleeces have been amazing. We are sending to America and NewZealand. Several shades have sold out - we are extending the range of both fleece and jersey, more arriving in ten weeks. The new Denims too, in muted shades seem to have hit the spot. There is always a temptation to print ugly owls and cringey cup cakes - to keep up with the trend. Sadly my days of being 'trendy' are long gone, I am now middle class, I eat Avocado and look forward to new issues the Farrow and Ball shade card. To balance my dullness, my daughter Nancy helps run Organic Textile Company and always manages to sneak a bright shade somewhere in the collection so if you see anything bright - its Nancys. Thanks for reading, best wishes from Phil and all at Organic Textile Company.